As a vegetarian (who occasionally eats eggs and/or fish), I’m always on the lookout for solid protein sources. As a mom, I also value recipes that pack a nutritional punch and that my kids get excited about. This recipe for Breakfast Cookies checks all of those boxes and, bonus, it’s super easy to make! The main ingredient in this baked good is something a little different – chickpea flour. Chickpeas are one of the many pulses we told you about earlier this year as part of our affiliation with USA Pulses and Pulse Canada, in honor of the International Year of Pulses. Now, before you turn your nose up to a chickpea flavor in cookies, let me tell you about the benefits of chickpea flour. It’s a good source of iron, folate, protein, and fiber. Chickpea flour can be used in a 1:1 ratio in place of whole wheat flour in many different recipes. It’s creamy, filling, and, for those who follow a gluten-free diet, this checks that box, too! Oh, and I should mention that we didn’t notice the taste of this flour at all. 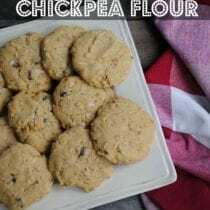 Most of the items in this recipe will be staples in your pantry, but if you don’t have any chickpea flour, you can make your own in 3 easy steps. For mornings when you need a quick, on-the-go breakfast (for you or your kids), this is a super option! Make a batch over the weekend and have them on hand and ready to eat. They can also be sent to school in kids’ lunches or eaten as an after school snack. Let me know if your kids love these as much as mine do :). In a large mixing bowl, combine the chickpea flour, baking soda, and salt. Make a well in the middle and add the honey, egg, coconut oil, vanilla, and nut butter. Mix wet ingredients together and then mix them with the dry ingredients until combined. Stir in the rolled oats and then fold in mix-ins. Make golf ball sized balls of dough, flatten, and place on the lined cookie sheet. Bake for 12 - 14 minutes or until golden brown. Cool on a wire rack. 1. Gluten-free if gluten-free oats are used. Pulses are cost-effective, nutritious, versatile, and sustainable foods that include dry peas, beans, lentils, and chickpeas. Find out more about pulses here and get some great recipes, too! This recipe sounds great, but I’m wondering if it’s possible to leave out the oats or are they needed to bind the ingredients together? Or maybe I could put them through the food processor so they are finely chopped? My son is not a fan of oatmeal and if they are too oaty as far as texture, he’ll complain and not eat them. He doesn’t like things with too much nuts and seeds either, so it’s a texture thing more than the taste. .
Hmmm; they do help bind the ingredients together. While I haven’t tried it, you could try putting the oats into a food processor or high speed blender to make oat flour out of them and using that. Please let us know if you try it and how it works! I haven’t made this recipe yet but in another recipe (oatmeal cinnamon chip) that calls for oats I put the oats in a food processor. I don’t make them quite as fine as flour but I grind them up a good bit. It gives the cookies a chewier texture that is quite lovely. You might be able to sneak them by the kiddo as the oats become part of the cookie rather than a textural add-in, if that makes sense. Thanks for the recipe! Made these today. They turned out delicious. I made mine a bit smaller & got 20 cookies. Yay! So glad you tried them and liked them:). you could do these without the egg. you could use the chick pea aqua faber you might find in a chickpea tin, whipped. I’ve heard of apple sauce and banana or psyllium as a binder as well. I have a can of chickpeas. If I’m reading this right I could process the chick peas and then use 3/4 cup pureed chickpeas and 3/4 cup whole wheat flour, correct? I think you need to start with dried chickpeas, not canned. They were delicious though, and really moist. My husband just walked by and said “Those cookies that you made are really good” Wait till I show him this comment thread and he realizes what is in them! I was wondering the same thing. My daughter has a peanut allergy. While I know sunbutter is a safe alternative, she has gone into anaphylactic shock 3 times from accidental ingestion of peanut and her body immediately rejects anything that remotely resembles peanut flavor. I was wondering if maybe almond butter would work? I made these today. Turned out pretty good. I used coconuts and raisins as my add-ins. Do you have the nutritional info on them? Fiber and sugar in particular? Hello. We do not provide nutrition details. This post might help explain why: https://www.100daysofrealfood.com/2013/01/04/healthy-eating-defined/. What kind of coconut oil did you use? I have one that is liquid and another that is solid? You can heat the solid coconut oil in the microwave so that it’s liquid. Do you think these would work as bar-style cookies? I honestly don’t know as I haven’t tried them that way. Please let us know if you try it! Can we store these cookies in the pantry or it needs to be in the fridge? Thanks. You can store them in the pantry. 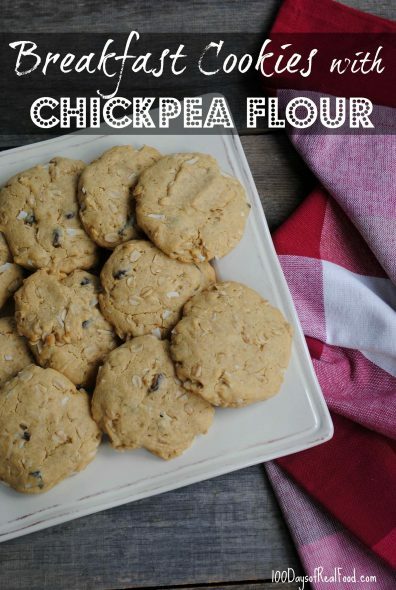 Do you think it’s possible to use almond or coconut flour in place of the chick pea flour? I would love to try these; however, I really would like to see the nutrients facts on these. Especially Protein, calories. ** Also in future posts as well. I love 90% of the receipts but since. My schools are not nut friendly I’m always looking for fun nut free Priotein snacks for my kids that are too extensive in calories. Thank you!! You are my favorite Blog!!! Hi there. We don’t post nutritional information. This post helps explain our philosophy: https://www.100daysofrealfood.com/2013/01/04/healthy-eating-defined/. I love your reeipes; can you PLEASE post the nutritional content? I’m looking for low calorie protein snacks for my kids! These have 249 calories and 7.1g protein. These look great! My very picky 10 year old doesn’t like oats. Do you think these would work without them? I was wondering the same thing. My 3 year old has an oat allergy. It may but it is not something we’ve tried. I made these last night for breakfast this morning. They are delicious and quite filling. After eating one and a peach, I was good to go for hours! Thanks for posting this yummy recipe. Yay! So glad that you liked them:). Can we make our own chickpea flour by putting dried chickpeas in a NutriMill? Yes you can. There is a link in the post above to making your own chickpea flour. Can these be frozen after baking and cooling? Thanks! I made these last night, used whole wheat flour instead, and used sun utter. This morning I broke one in half and the inside of the cookie is green! Checked a couple of them, and they’re all green! What caused this?!?! I made mine with sunbutter from Trader Joe’s and they didn’t turn green. Hope this helps! Can I use another sweetner in place of honey? Would maple syrup work? Hi. While I’ve not tried it in this recipe, we do often use the two interchangeably. Can we use butter in place of coconut oil? Hi there. Yes, coconut oil should work, too. This might help: https://www.100daysofrealfood.com/2012/02/07/how-to-cook-with-coconut-oil/. No, I asked if I could use butter instead of coconut oil. I would prefer butter so I don’t get the coconut taste in these because my son doesn’t like them. Dried chickpeas? Is there something about soaking chickpeas overnight to make them more digestible or am I making this up!? I’ve tried to incorporate chickpea flour is so many of my recipes but I just can’t get the quantities and ratios correct! Also, I don’t love the flavour of chickpea flour? Can you taste it in these cookies? I bake with gluten-free flours and I ‘think’ I’ve found the perfect combo; a 1:1 ratio of oats and rice flour! Hi. You really can’t taste the flour. Has anyone tried peanut butter or almond butter instead of sun butter? I have not tried it yet. I’m sure either will work great, but would love your feedback if you try it! My dough seemed really oily, is it ½ c melted coconut oil? I also used Crazy Richard’s 100% peanuts creamy peanut butter, maybe that added extra oil? They’re in the oven now, so I’ll see how they turn out! Hmmm … was the peanut butter oily? That could end up adding too much moisture. Keep me posted on how they turn out! Yay!! I’m so glad that they worked – hope you guys enjoy them:).